Their dinner originally wouldn't be occupying that much of a time. Although Linze in the end wasn't able to enquire whoever the guy was that Xu Yanyan liked, he didn't mind it the least bit. As the aim of him giving Xu Yanyan that sort of question was in order to have the conversation be carried on cheerfully. Linze didn't really want to find out which guy it was that Xu Yanyan liked, as he wouldn't be that much of a busybody. Anyway, even if Xu Yanyan was to tell Linze about a bizarre middle-school boy's name, he himself would definitely more or less not recognize that person. After concluding the dinner with Xu Yanyan, Linze and Xu Yanyan walked out of the eatery. Linze could see that Xu Yanyan's current mood seemed to be rather good, hence, he was able to feel relieved. Initially, when they had just met earlier today, he could discern out that she was a little nervous. But right now, it looked like today's actions were extremely successful, as the relationship between him and Xu Yanyan have harmonized quite a bit. Hopefully his efforts today, would be able to aid Xu Yanyan in relieving some portion of her loneliness. As he would still need to continue going to school as per normal tomorrow, added with the burden of homework to do, hence after finishing their dinner, Linze didn't arrange for any other activities. And in order to show that he's a very knightly person, as well as to indicate that he's a qualified senior. Hence after walking out of the eatery, Linze suggested towards Xu Yanyan. Xu Yanyan had seemingly rejected Linze's suggestion immediately without even thinking about it. Xu Yanyan didn't continue saying, but Linze had already understood her meaning. Since there's someone from her family coming over to the bus stop to pick her up, there's indeed not a need for him to send her back. Plus, with regards onto several aspects of its significance, it may not be a good thing for him and Xu Yanyan to be seen together by her family. Furthermore, he had once heard his sister mentioning, its rumored that Xu Yanyan's dad was an extremely obstinate person. If it's misunderstood that Linze and his daughter were to have an early relationship, it's evident that the both of them wouldn't be spared from receiving a scolding. Perhaps it was due to luck being in his favor, for when Xu Yanyan had just brought Linze to the bus stop, a bus that Xu Yanyan would be taking had arrived. Xu Yanyan said to Linze. Xu Yanyan smiled as she said towards Linze, and after she had finished speaking, she boarded the bus. Looking at the gradually embarking bus, Linze gave off a lazy stretch. To a person like Linze who very seldom had conversations with the opposite gender, it was an extremely tiring task having maintained such a long period of time cheerily chatting with a girl. After returning home through foot, Linze first chose to take a shower. After washing away his fatigue, he returned to his room and took out a couple of books from his bag, laying them out on his desk, and switched on the lamp located by the side. As he knew that he would be having dinner together with Xu Yanyan tonight, he thus seized upon the moments during lessons, and had completed quite a number of his homework, hence the current remaining homework wasn't quite as much. Just when Linze was about to start doing his homework, he felt that he heard that familiar ringtone of his phone. It seemed that someone had given him a call. Don't tell me that Yanyan had already reached home? Linze hence immediately laid on his bed and picked up his phone from the pillow sides. Looking at the person who made the incoming call, it wasn't Xu Yanyan, but Tangyin instead. After picking up the call, that extremely energetic voice of Tangyin resounded over from the smartphone. Seemingly noticing that Linze's response seemed to be a little half-hearted, Tangyin hence said. Linze had his head tilting towards an angle upon hearing Tangyin saying it as such, what was this person thinking already. Tangyin's voice suddenly turned rather deafening. Linze only felt his eardrums not being able to take it anymore, and immediately wrenched the phone away from his ears. After Tangyin's voice once again regained it's normal self, that sort of words resounded from over the phone. Linze hadn't understood clearly on what was happening, for the jump in Tangyin's thinking were too enormous. Tangyin from the other side of the call seemed to be in quite an agitated mood; Linze was able to visualize that just from hearing her voice. Hence he slightly gave off a sigh. And thus, after continuing to chat with Tangyin for a while, due to worrying that the studying time for Tangyin's side being insufficient, Linze hence chose to initiate finding an excuse to hang up the call. Linze glanced at the call duration, it lasted 20+ minutes. Just as Linze was looking at the call duration, a message leapt up onto the middle of the smartphone screen. While seeing that message, Linze knew that Xu Yanyan should have already reached home, and had attempted to give himself a call. A smiling Linze tapped on the textbox column of the reply area, intending to send Xu Yanyan a message in response. But Linze hadn't even typed out a single word when a piece of message jumped out, interrupting his typing. Linze glanced at the phone's screen. He was extremely certain that this and the previous message had the same exact contents. The duration between the sending of the two messages were only a minute long; Linze felt that it probably would be Xu Yanyan's accidental mistapping and having it being sent again. Just when Linze was about to once again key in some words, this time, it was three simultaneous messages being sent over. The sender of all these three messages were still from【Xu Yanyan】. These 5 messages were neatly arranged on Linze's phone screen. Linze roughly scanned the sent timings for those messages, and had by chance discovered that the sent timings for all of those messages had a gap duration of 1 minute. Just so perfect that it's a minute, which would be a gap duration of 60 seconds. Not a second more, or neither a second less. An extremely precise, 60 seconds. Realizing onto this point Linze was even more certain about the thoughts within his mind; as expected, she should have accidentally mistapped, or perhaps there's some sort of problem with Xu Yanyan's phone. Just when Linze was planning to send a response, his typing was once again being interrupted. But this time, what interrupted Linze's typing wasn't a【text message】, but an【incoming call】instead. And the caller was【Xu Yanyan】. 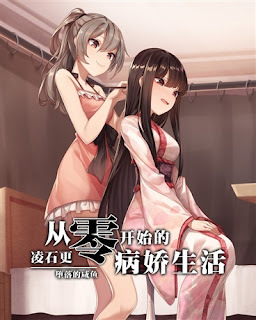 Just noticed that this novel came from the same site as all the other Yandere novels....I swear that site is breeding ground for Yandere novels. btw does anyone know any yandere novel that actually has been fully tled?